On saturday, october the 29th, Tommy Betzler, Sammy David and Michael Brückner appeared as additional act in the „upper room“ on 2016‘s e-live festival at oirschot, the netherlands. They performed three sets (two shorter and one longer) at the beginning of the festival and in the breaks between the acts on the main stage. The three tracks on this album - although studio recordings - reflect their first two sets (which were largely improvisations). The bonus track is a live-in-the studio version of the closer of the third, and longest set. live video filming and editing (set 3) edsamazing.com The 1st thing which strikes the ear is the very smothered atmosphere which surrounds “Triplet”! A little as if the band of Michael Brückner and Tommy Betzler was in the next room! For the rest, this last sound madness of Brückner & Betzler brings us to the same hallucinogenic borders as Two, realized some 12 months earlier. It’s within the framework of the show offered at the E-Live festival of Oirschot, in the Netherlands in October 2016, that the roots of “Triplet” began to evolve. Or a few weeks before while the duet, which becomes finally a group of 4 musicians with the addition of Sammy David, which is clearly more present here, and of Fryderyk Jona, superb on the Moog Voyager, has developed the long sound textures on the basis of the improvisation for this concert. The first seconds of "The Trip" are flooded by an avalanche of synth lines which flit around such as long trails of buzzing bubbles. A dramatic effect falls. It is follo wed by a piano, at the same time incisive and pensive as well as rollings of percussions smartly scattered among some well-structured gap between the rollings. With this introduction of atmospheres and very colorful tones, "The Trip" brings us to these sweet periods of madness where the LSD used to flow inside the veins in the nice time of the 70’s. And this floating journey gets some more of self-assurance with layers of voices, Mellotron flutes and riffs of guitars lost in this hallucinogenic decoration. Little by little, "The Trip" takes shape with sound perfumes which tickle our souvenirs. Souvenirs of Tangerine Dream of the Pink years and then the Blackouts and Correlations years of Ashra, when the title goes out of its cocoon of atmospheres at around the 8:30 minutes with a movement of the sequencer which frees loops of fluid rhythms. Loops which roll in loop and establish a steady pace where burst out percussions and guitar solos which make court to those of Fryderyk Jona's Moog. From ambient to heavily sequenced, "The Trip" engages in 3rd speed in a furious electronic progressive rock where the cacophony will never have been so delicious. 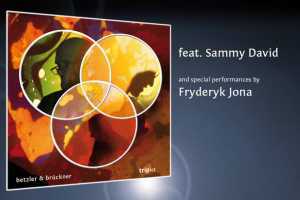 After an introduction shaped on the same theme, "Trilogy" stays in the same plate with a good progressive and cosmic electronic rock which highlights the very aggressive guitar of Sammy David. His solos are energetic and his fingers seem as agile as a thick cloud of moths on a structure which flirts with a solid rock, the percussions are very good, and with short phases of ambiences, the effects of synth and this amalgam of pads and riffs which always spin in the background of the decoration are just in the times. Scorching, intense and very good, the walls are rippling and the ears bleed, it’s the kind of title that makes open wide the ears so much the sonic envelope is rich and multicolored! "Doublette" is the only title to be performed by the duet of Brückner & Betzler. The pair explores the boundaries of EM wi th a first phase of ambiences where the synth layers are spinning with an effect of staccato between the meshes of the void, while a synth makes its laments go off the rails which reach the turbulences of a sequencer of which the oscillating chords are dancing with the crystal clear acrobatic touches of the electronic percussions. Little by little, the rhythmic bazaar settles down in the convent of "Doublette". Tommy Betzler's drum is ordering at a sustained pace to support the evasive movements of the sequencer and the synth solos that Michael Brückner throws with a surprising fluidity in the colors and the twists. The improvisation gets clearly more felt as the seconds run to the meter with a fight between percussions and effects of synthesizers which push "Doublette" in a kind of Jazz without borders. Well sat on these 23 minutes, Brückner & Betzler maintains a good pace. Even in the more ambient or the quieter phases which give them the necessary breath to make raise the very acid rhythms of "Doublette". "(Three) To the Flame of Life" explodes between our ears, following the finale rather silent of "Doublette", with clatter. Waves of cymbals are rolling over some wonderful solos from Fryderyk Jona and on the hoarse breathes of Michael Brückner's synth. A bass line chews its breath while are always singing these masterful solos which bring us to the essence of EM. Intense and poignant in its sound shroud which floats like the strange flavors of the 70’s, "(Three) To the Flame of Life" borrows a more livened up path just before the door of the 4 minutes with a good movement of the sequencer which structures its keys in a nice zigzag and among which the wide loops which it forms in an eight are crossed by another movement of sequences. We are in the most electronic phase of “Triplet” with sequences which are the cradle of a hopping cosmic rhythm coated of oneiric effects of cosmos and of songs of synth which coo like those whales in the bed of the oceans. The rhythm is steady and a synth gets loose from this oceano-cosmic environment in order to throw effects of robotics chirping. And it’s a few seconds farther that Tommy Betzler knocks out the rhythm with a sustained fury. Sammy David will follow later with some very good solos guided by agile fingers which like to draw wide loops filled of shrill colors. The title gains some rest in the astral tranquility such as imaged with images of Fryderyk Jona before bouncing in another heavy and swirling rhythmic surge decorated with other treasures in the forms of solos always so rich and fluid. Solos which are at the heart of the charms of this 2nd rendezvous with the music of Brückner & Betzler. Now, “Triplet” comes with a little cadeau for the first 100 copies. A DVD-R in limited edition which presents some interviews, in English and in German, of Michael Brückner, Tommy Betzler and Sammy David within the framework of the Oirschot concert. We can also view here the rehearsals of this concert with the visual concept which is signed by Edward Rink and Jeroen Bouma as well as to listen to MP3 files. In brief a little gift which is pleasant to look on a laptop because the navigation on a DVD player can turn out complicated with the proposed formats.